From wired.com A new book called Surf Craft: Design and the Culture of Board Riding by Richard Kenvin demystifies the art, craft, and history of surfboards. 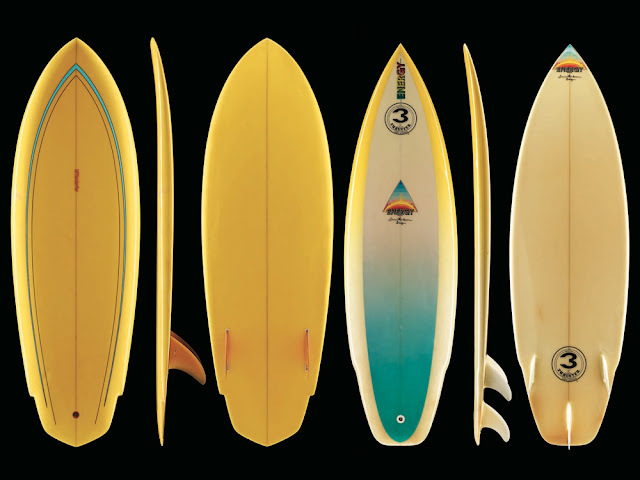 CLASSIFYING A SURFBOARD design as gremmie or gnarly is almost impossible unless you’ve been initiated into the sun-drenched sub-culture of surfing. 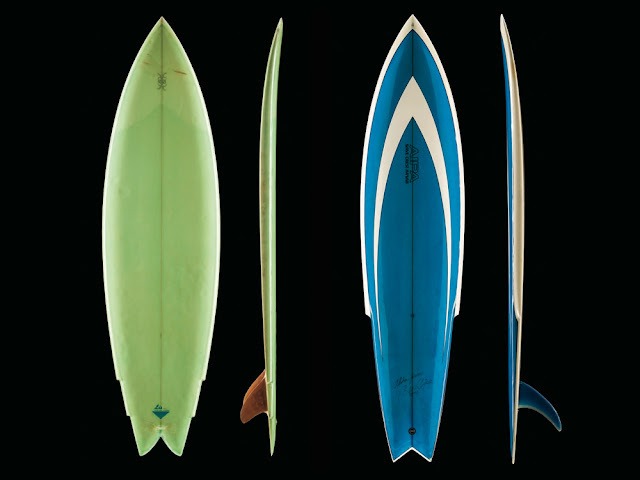 Fortunately for Bennys, Barneys, and Goat Boaters, a new book called Surf Craft: Design and the Culture of Board Riding by Richard Kenvin demystifies the art, craft, and history of these objets d’art. Kenvin’s survey covers some of the basics of good board design, but focuses most of its pages on the personalities behind the planks. It starts with the first Western observation of surfing from Captain James Cook’s third voyage to Hawaii in 1769. Skipping ahead to 1885, it follows a trio of Hawaiian princes to a California boarding school where they commissioned a Santa Cruz saw mill to cut redwood boards similar to those popular on the Big Island. The seeds planted by the princes blossomed on the mainland during the first decades of the 20th century, thanks in large part to a charismatic surfer named Duke Kahanamoku. Born on O’ahu during the twilight of Hawaii’s time as an independent kingdom, Kahanamoku rode his 16-foot-long, 114-pound Koa wood Olo board for an American public fascinated by action sports and orientalism. These heavy boards couldn’t carve up the waves, but their length provided balance for languorous runs and acted as counterweights for riders to pull tricks like hanging ten toes over the nose of the board. Stories of Kahanamoku’s exploits as a surfer and Olympic swimmer spread through the US, as did surfing stories by Jack London. By 1924 these tall tales inspired Tom Blake, a midwestern haole, to head to Waikiki to surf alongside his hero, Kahanamoku. Blake started restoring boards at a local museum and this reverence for the craft, paired with time on the water, spurred a raft of original ideas. He employed laminated construction methods, drilling hundreds of holes in the core of the board before sealing the surface to create air pockets, in order to reduce their weight, increase buoyancy, and reduce the strain of paddling. He added a ventral fin to increase stability, and critically, came up with the idea of selling DIY board kits through the mail. One of these kits made it into the critically injured hands of a teenager named Bob Simmons who used the board as a physical therapy aid to recover from a traumatic arm injury that nearly required amputation. Simmons was a high school dropout who managed to get accepted at the California Institute of Technology. He applied a rigorous engineering process to the design of boards, utilizing lessons learned from his classes, tip cribbed from prohibition era rum-running boats, as well as post-work experience designing bombers during World War Two to maximize hydrodynamic performance. 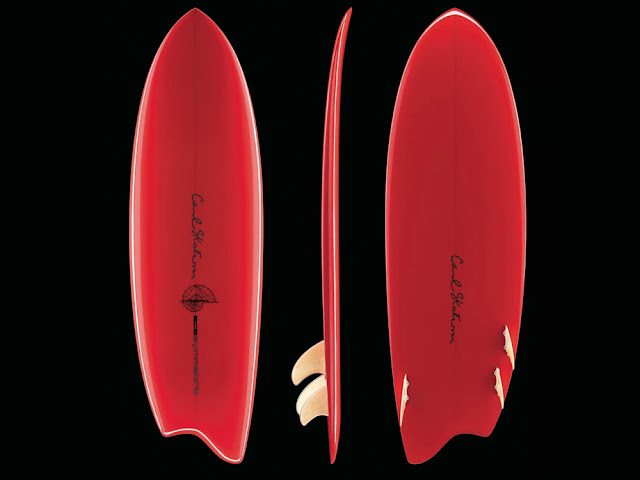 A contemporary of Charles and Ray Eames, Simmons ended up utilizing many of the techniques and materials they used to reinvent furniture—fiberglass, foam, and resin—to craft his boards. The result was a wider board, with a spoon-like nose, and carefully sculpted edges or “rails.” Big air tricks were still out of the question, but Simmons’ innovations made it possible for riders to more precisely control their movements and go faster than heavier, less-refined boards, would allow. Simmons died in a surfing accident in 1955 at age 35, but the release of the film Gidget in 1959, the debut album from the Beach Boys in 1961, and the premiere of canonical documentary The Endless Summer in 1966 super charged surf culture. Soon manufacturers turned a humble hand craft into a high volume business. Still, board shapers continued to innovate. George Greenough, who Kenvin describes as hyper-creative and mildly eccentric Australian influenced the sport with shorter, more maneuverable boards that allowed surfers to get vertical and take to the air in acrobatic displays. In 1967 Steve Lis, a body surfer and kneeboarder, invented the iconic split tail, twin fin “fish” board which combines the mobility of short boards with the wide, buoyant platforms that long boards provide, making it possible for a single board to handle a wide variety of waves from small swell to big curls. As the sport of surfing professionalized, with stricter performance characteristics for competitions, Simon Anderson invented the tri-finned “thruster” in 1980. His smaller, tri-finned board moved faster than single finned boards, but was more responsive than dual fin models. This balance has left it as the de facto board for competitive surfer dudes and dudettes for for 35 years. Still, shapers continue to push boundaries in search of the perfect ride. They experiment with new board geometries, both symmetrical and asymmetrical, the number and placement of fins, and new materials fuel their quest in search of the ideal wave and perfect board to ride it. 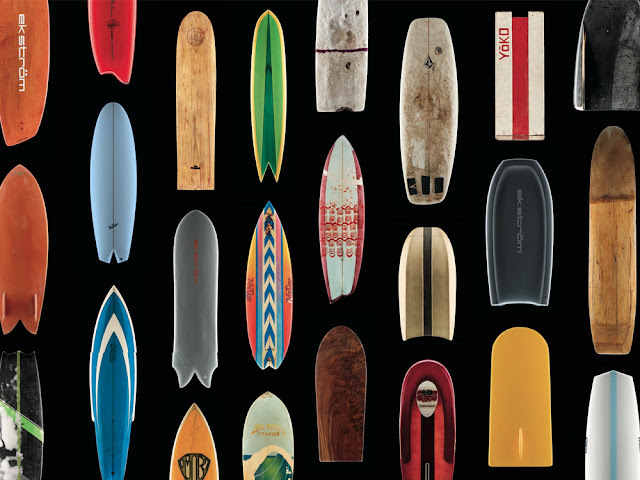 Surf Craft: Design and the Culture of Board Riding is published by the MIT Press.